Getting support for Envira is as simple as opening up a support ticket with us. However, below are some helpful hints to review before requesting support. Is the Hosting Service up-to-date? Is Envira Gallery plugin up-to-date? Have you reviewed our debugging documentation? Step 1 – Is the Hosting Service up-to-date? The latest WordPress release (as of January 2018) recommends PHP 7.2 or higher, MySQL 5.6 or greater OR MariaDB 10.0 or greater, HTTPS support and The mod_rewrite Apache module. You can find more about hosting services and requirements here. Sometimes images do not load or there are problems that are caused largely because a hosting service is not working properly or it is not up-to-date with the latest WordPress requirements. If you are a new customer and are having problems loading Envira on your website, checking your hosting service should be your first priority. Again, this may seem basic, but it is crucial. Are you running the latest release of WordPress? If not, you are more vulnerable to bugs, security vulnerabilities, and problems with plugins. If you need help in updating WordPress, check out their documentation here. Step 3 – Is Envira Gallery plugin up-to-date? We have already created a document talking about installing and activating Envira, so I encourage you to check that out and ensure your Envira plugin is activated. The next step is very similar, make sure Envira is up-to-date with the latest version and that all your Addons are both updated and activated. If you need help, check out WordPress’s plugin documentation on managing plugins. Step 5 – Have you reviewed our debugging documentation? While this guide has addressed more general and generic issues that could interrupt your use of Envira Gallery, we actually have a more in-depth debugging guide here. Please check out this guide first, before moving on to Step 6 below. Step 6 – Is support still needed? Provide a web-address for the website in question. Be specific (as much as your technical ability allows) as to both the problem and your desired functionality for Envira. Be concise. To be specific, you may need paragraphs to describe the problem. If multiple questions, consider using bullets or numbers to help make clear you have multiple questions, concerns, or suggestions. You will have access to email support once you log in to Envira. Log in to your account here at Envira. From your home screen, you should see something like the screen below. Click Support. Name* — Important so we know who we are talking to. Email* — Important so we can actually reply back to you. Subject (drop down list)* — This helps us quickly identify the type of question you are asking. “I have followed the Debugging Steps” at https://enviragallery.com/docs/debugging (checkbox)* — A lot of problems can be resolved by following our debugging guide. Website in Question* — We need to know where you website is so we can track down any bugs or issues that may be occurring. The exact URL where we can see the issue — This is important. Often times, you may have a gallery on some blog post or other page. Please share this URL so we can quickly resolve your issue. WordPress Administration Username — Helpful for backend /admin-side debugging. WordPress Administration Password — Helpful for backend /admin-side debugging. Bug / Issue* — This needs to be both specific and concise for best results. What do we mean? Give the list of steps to replicate the issue. Tell us what the exact problem is versus what you were expecting. Bullet points are very helpful here. 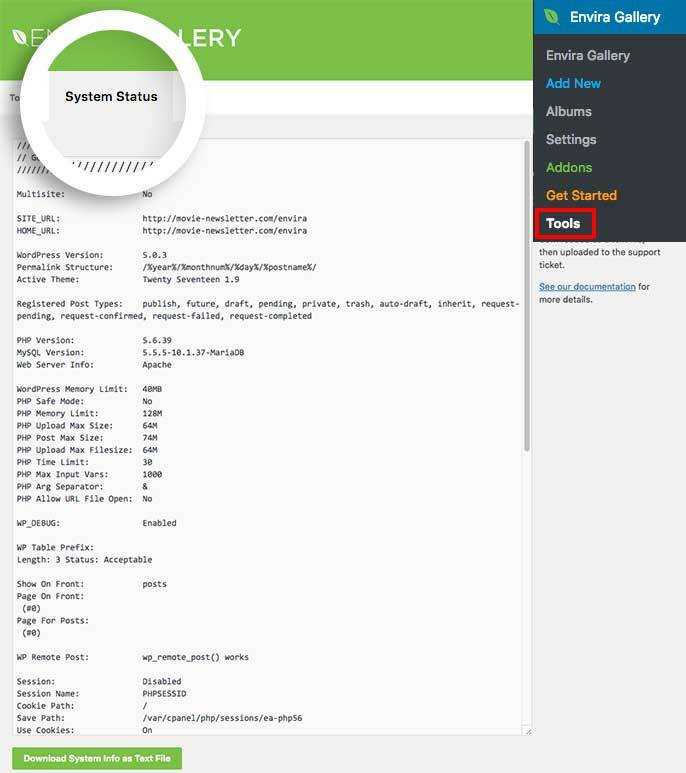 Include your system info – Logging into your WordPress Admin » Envira Gallery » Tools » System Status tab to grab System Info file to include in your support request. After you hit SUBMIT then our system will receive your support ticket. We will respond as quickly as possible to resolve any issues and to help make your website the best it can be. In the meantime, remember to check out our debugging guide, our extensive documentation, or visit our blog.